Thanks to Rod Corey and the 8th grade team for creating this exciting learning opportunity for their students! On Monday, November 6, 8th grade students were treated to a first-hand account of how our government works. Sammy Potter, Yarmouth High School Senior, spent the spring semester of his junior year working in Washington, D.C. as a page for Susan Collins. Sammy shared personal anecdotes of his time working closely with senators and representatives, in addition to his passion for politics. 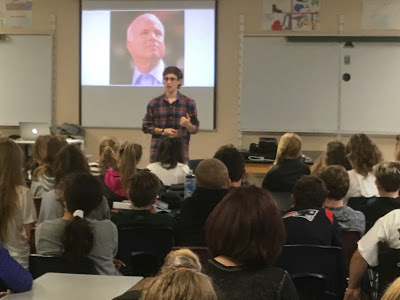 He encouraged 8th grade students to participate in our democracy through the support of a candidate for office, or by being knowledgeable about the issues of our time. Our thanks to Sammy for taking the time to share his experiences and enthusiasm for being involved in the political process!